About The Book: Virginia Phillips has spent her career helping others achieve their dreams through entrepreneurship. Her coaching and mentoring have enabled many business owners to realize their full potential. Now, the bestselling author of Yes, You Can! 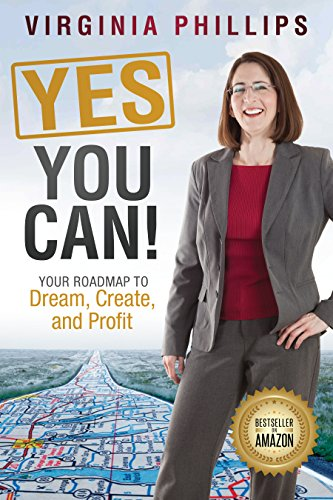 Your Roadmap to Dream, Create, and Profit is extending this help to others by offering a free copy of her book through her website for a limited time. Yes, You Can! helps business owners find the keys to success by guiding them through strategic planning and changing their mindsets to those that breed success. By focusing on existing strengths and “small beginnings,” Phillips advises to those who are struggling to find emotional safety and true leadership to utilize intelligent data and determine what really matters to them. About Virginia Phillips: Virginia Phillips is a bestselling author, international speaker, and entrepreneurial coach. Her unique ability to build valuable relationships with others from a variety of backgrounds has made her a sought-after expert. She was awarded the VIP Woman of the Year Circle of Excellence Award for 2017-18 and was also nominated for the Best of Colorado Springs for 2018. For more information, visit www.AOEEnow.com. This entry was posted in Award, celebrity, honoree, Recognition, women and tagged Amazon, Bestselling Author, book, coach, entrepreneur, entrepreneurial, entreprenuership, excellence, international, motivational speaker, public speaker, relationship, success, Today's Honoree, Virginia Phillips, woman of the year, writer, Yes You Can. Bookmark the permalink.